You must be a regular on road cyclist, who is confident riding in traffic at a standard that meets Bikeability Level 3 environment and who can pass that confidence on to others. This is a very practical course that involves considerable time on bikes. You must have access to a helmet, suitable clothing for all weathers, a roadworthy bike and bike lock for each day of the course. Any experience of teaching or coaching young people and adults is beneficial and encouraged. The instructor course prepares you to deliver Bikeability Level 1, 2 and 3 courses to adults and young people. By the end of the course, you will have improved your own personal riding skills, learnt how to teach groups and individuals, how to provide a safe training area and how to assess when your trainees have achieved their outcomes. Following successful completion of the four day course, you will be awarded Provisional National Standard Instructor (NSIP) status by the Department of Transport. After completing the course and upon reciept of a satisfactory DBS check, you would work within the Plymouth School Sports Partnership Bikeability scheme where you would be mentored whilst you develop as an instructor. Within six months of completing your Insructor Training course, you will complete a Post Course Assessment. Upon successful completion of your Post Course Assessment, you will be awarded Qualified National Standard Instructor (NSIQ) status by the Department of Transport. If you are interested in becoming a Bikeability Instructor for the Plymouth School Sports Partnership, we would encourage you to contact our Cycle Support Officer, Jonathan Tutte, for further details and to arrange an informal cycle ride prior to the course. During week commencing the 8th June 2017 the Plymouth School Sports Partnership cycle training machine made its way to Plymouth School of Creative Arts . With Bikeability training sessions running across the school. Students from years 5, 6, 7,8 and 9 have been taking part to improve their riding skills. Students have been gaining practical skills and understanding how to cycle on todays roads. The Bikeability sessions have allowed students of all levels to gain skills and confidence for all kinds of cycling. Levels 1,2 and 3 develop students skills from the basics of balance and control all the way to planning and making an independent journey. Plymouth SSP are offering anyone interested in cycling, who has a background in coaching and able to pass all relevant safeguarding checks the opportunity to become a National Standard Cycling Instructor. If successful you will help us deliver Bikeability to children and deliver adult sessions across Devon. The Course fee is normally £549 and full details can be found here http://bit.ly/2sU2WkG, however these fees will waived if you apply through us first and deliver a minimum of two full courses with the aid of our instructor team. Today Plymouth SSP said goodbye to three of its valued instructors and we couldn't let them go empty handed. Penny Allan has been with us since 2008, when Plymouth SSP first took on cycle training in the city and has been instrumental in guiding the delivery of Bikeability across the city. Although you may not see Penny on the roads with the cities children as much, you may well see Penny hurtling down a hill as part of the women’s mountain bike scene. Peter Javes has also worked for us for a number of years after moving from out of county to work at South Dartmoor as part of the old School Sports Partnerships. When local the local authorities took back control Peter joining The Cycling Partnership (TCP) delivering in the Totness area before joining us, and has been instrumental in promoting Bikeability in the South Hams area of the county. Callum Harbord is one of the newest members of the team and is moving to London, where he will join one of the many delivery teams. All three instructors will be missed by the team and by the 1000’s of children who they have trained. Adaptive Cycle Training Now LIVE!!! Working in partnership with Access Plymouth, we are now delighted to be able to offer free adpative cycle sessions in the city centre. 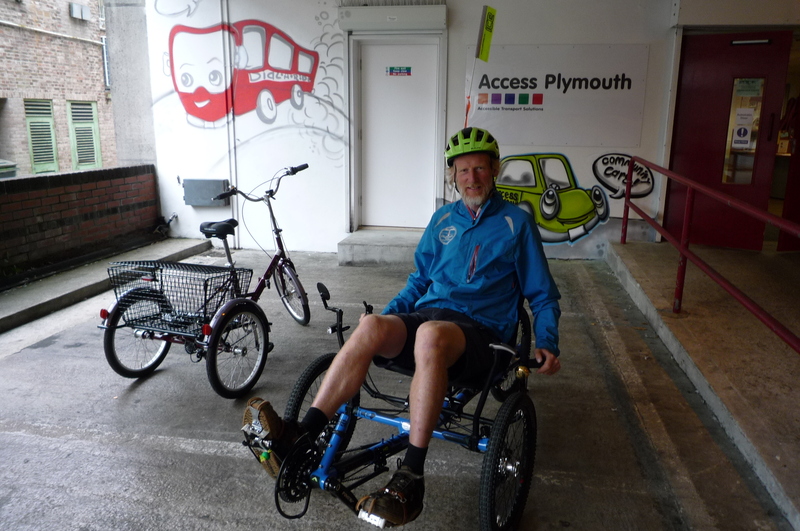 Jonathan Tutte, one of our lead instructors visited Access Plymouth to see what it was all about and as you can see from the pictures, he had a great time! Provisional figures published today (26 Oct) by the DfT show there were 1,710 road deaths in the 12 months ending June 2017, a 5% fall compared with the corresponding period ending June 2016. There were 27,130 killed or seriously injured casualties (KSIs) in the same period, but the DfT says ‘comparisons of this figure with earlier years should be interpreted with caution due to changes in systems for severity reporting by some police forces’*. Traffic levels rose by 1.4% in the same period, meaning the fatality rate per billion vehicle miles travelled fell by 6%. Looking at road user type, there was a rise in the number of pedestrian casualties - up 1% to 24,190. Of those, 6,100 (25%) were KSIs. Cycle casualties also rose by 2% to 18,870, and of that figure, 20% (3,830) were KSIs. Plymouth SSP and it’s Consortium partners provide cycle training courses in Plymouth and Devon to provide guidance on riding safely on today’s busy roads and in future years we hope to see these figures fall. October Half Term 2018 - Courses Available to Book Now! Bikeability holiday courses running in October Half Term are available to book now! We have confirmed courses in Plymouth, Ivybridge and Tavistock, with courses in the Exeter area being finalised. Spaces are limited, so be quick! If there are no dates showing against a course, this means the courses are full. Keep checking back for further updates! "My daughter participated in the Bikeability course at her primary school. Even though she has used her balance bike for a while, she loved the course and it definitely improved her bike skills and made her more confident - so much so that she wanted to try cycling her pedal bike with no assistance and managed to cycle a short distance with no support. I think the course is great and a huge benefit to children." Feedback from Dunstone Primary School who had children from Year 5 take part in Level 1&2 Bikeability in March 2019 - "Seeing all of the children's confidence increase over such a short period of time has been fantastic. So many of our children don't get experiences like this and so funding for these projects to continue is so important. What a fantastic duo of instructors - thank you." Feedback from Salcombe Primary School who had children from Year 5 take part in Level 1&2 Bikeability in March 2019 - "Great for children's confidence. Every year the children love it!" Feedback from Weston Mill Primary School who had children from Reception take part in Bikeability Balance in February 2019 - "Very successful, promotes active children, gives some children the opportunity to learn something new - especially Bikeability Balance"
Feedback from Sparkwell Primary School who had children from Years 5 and 6 take part in Level 1&2 Bikeability in February 2019 - "This was our first Bikeability programme and we were happy with the experience and professionalism of Tony & Martin. The booking staff were helpful." Feedback from South Brent Primary School who had children from Year 4 take part in Level 1 Bikeability and children from Year 5 take part in Level 1&2 Bikeability in January 2019 - "The staff who delivered the training were fantastic - very organised, friendly and they made the sessions fun. The children gained a huge amount of confidence and learnt some life skills that will hopefully keep them safe. Thank you all once again, We look forward to you coming next year."